One of my favorite holidays is Easter. I love taking time to focus on how Jesus redeemed me and the magnificence of this day. But every year it seems like I get more focused on other things, kind of like the time of Christmas, and forget about where my attention should really be. 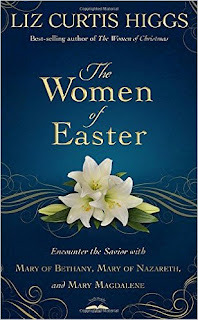 For this reason, I have loved reading The Women of Easter by Liz Curtis Higgs. Now, I just about everything Higgs writes, but this book was special to me. I loved that she focused on the women in the Easter story and not just Jesus. As she walks you through this book you encounter Jesus through 2 different Mary's: Mary of Nazareth, Mary Magdalene, and Mary of Bethany. As always, this book is fantastically written with amazing insights into biblical scripture and a few bits of humor here and there. Higgs writing is spot on and so eloquent but yet very easy to read and comprehend. When you start this book, you will be pulled in. Be prepared to meet your Savior through the lives of these amazing women. Women who had the extraordinary opportunity to meet him! As for my overall feelings, this book is fantastic to use as a Lent study for a women's group or just by yourself. You will love it!